3-Evelyn Richardson was born on 6 Jan 1884 in Deloraine, Tasmania and died on 12 Aug 1965 at age 81. Evelyn married Melvyn George Badcock, son of William Badcock and Susan Anne Scrivener, on 20 Apr 1910 in 37/1910/1418. Melvyn was born on 18 Jul 1879 in Westbury, Tasmania and died on 24 Sep 1964 at age 85. Evelyn was the eighth child of Isaac and Mary Richardson and was born on 6th January, 1884. She lived at the Back Place, Paddy's Scrub and later moved to Room's Place" Exton. Evelyn attended Ned Blythe's school and the Wesleyan Methodist Sunday School. When she was 23 years of age, the family moved to Lenna, Hagley. On 20th April, 1910 at the age of 26 years, Evelyn married Melvyn George Badcock and moved to Sunny Rises. It was a month later before they moved into their home as repairs were being undertaken. Sunny Rises had been purchased by William Badcock in 1908 and Melvyn rented the property from his estate. Evelyn had a family of six children, all being born at Sunny Rises — Eric — born at home and attended by Nurse McShadel of Westbury, Trevor — born at Mrs. James, Longford, Tasman — born at home, Melvie got Nurse Coppa from Bishopsbourne. Tasman was a mature baby, but died at birth. Evelyn had had headaches while carrying the baby and Melvyn got tablets from Longford. The nurse said the tablets should not have been taken as they were only used by "bad girls" and probably killed the baby. Tasman was buried in a cardboard box in the Green Rises garden. Joyce, born at Green Rises (Nurse McShadel -Jeff, as with Joyce — Lloyd, born at Nurse Harvey's hospital, Deloraine. Until her old age, she generally had good health. She was a hard worker, baking all her own bread, cooking for up to 20 hungry men with the thrashing machines three times a day. Evelyn had to attend the horses. She did her own gardening, mostly vegetables but some flowers. They were very interested in the Methodist Church. She was an organist and did a great deal of cooking for the Sunday School tea meetings, church fairs and also the local school. Evelyn was the longest living member of her family and died on 12th August, 1965, aged 81 years. 4-Eric William Badcock was born on 28 Feb 1911 in Bishopsbourne, Tasmania, died on 28 Jun 1996 at age 85, and was buried in Jun 1996 in Church of England Cemetery, Bishopsbourne, Tasmania. Eric married Elma May Page, daughter of John Thomas Page and Rose Alice Rebecca McGiveron, on 23 Apr 1941 in Methodist Church, Bracknell. Elma was born on 22 Mar 1920 in Launceston, died on 4 Apr 1999 in Toosey Memorial Hospital, Longford, Tasmania at age 79, and was buried on 8 Apr 1999 in Church of England Cemetery, Bishopsbourne, Tasmania. They had five children: Yvonne Joyce, Ivan John, Keith Eric, David Melvyn and Janine Gaye. 5-Yvonne Joyce Badcock was born on 27 Jan 1942 in Queen Victoria Maternity Hospital, Launceston. 5-Ivan John Badcock was born on 19 May 1943 in Launceston. Ivan married Joan Lynnette McLean on 26 Nov 1966 in Margaret Street Methodist Church, Launceston. Joan was born on 13 Jul 1946. They had four children: Philip Melvyn, Merryn Joan, Neil Ivan and Paul Wesley. 6-Philip Melvyn Badcock was born on 3 Sep 1967 in Queen Victoria Maternity Hospital, Launceston. 6-Merryn Joan Badcock was born on 12 Apr 1969 in Queen Victoria Maternity Hospital, Launceston. 6-Neil Ivan Badcock was born on 26 Aug 1970 in Queen Victoria Maternity Hospital, Launceston, died on 18 Aug 1974 in Royal Hobart Hospital at age 3, and was buried in Aug 1974 in Carr Villa Rose Garden 33, Launceston. 6-Paul Wesley Badcock was born on 14 Apr 1973 in St. Helens Private Hospital, Hobart. Paul married Julie Ann McKaskill in Anglican Church, Newstead, Tasmania. Ivan next married Vicki Elaine Rushton on 29 Jan 1983 in Lawrence Vale Uniting Church, Launceston, Tasmania. Vicki was born on 24 Mar 1952 in Queen Victoria Maternity Hospital, Launceston. They had five children: Elizabeth May, Rebecca Elaine, Laura, Caroline Kate and Andrew John. 6-Elizabeth May Badcock was born on 15 Feb 1984 in Burnie Hospital. 6-Rebecca Elaine Badcock was born on 18 May 1985 in Burnie Hospital. 6-Laura Badcock was born on 28 Feb 1987 and died on 28 Feb 1987 in Devonport Hospital. 6-Caroline Kate Badcock was born on 21 May 1988 in Devonport Hospital. 6-Andrew John Badcock was born on 21 May 1988 in Devonport Hospital. 5-Keith Eric Badcock was born on 22 Sep 1946 in Queen Victoria Maternity Hospital, Launceston. Keith married Foki Kovi Nise Cli Tanaika in Uniting Church, Bracknell, Tasmania. Foki was born on 9 Dec 1962 in Tonga. They had eight children: John Martin, Robert David, William Eric, Evelyn, Melvyn Keith, Benjamin James, Steven Paul and Daniel Thomas. 6-John Martin Badcock was born on 18 Sep 1985 in Queen Victoria Maternity Hospital, Launceston. 6-Robert David Badcock was born on 14 Feb 1987 in Queen Victoria Maternity Hospital, Launceston. 6-William Eric Badcock was born on 29 Jun 1988 in Queen Victoria Maternity Hospital, Launceston. 6-Evelyn Badcock was born on 7 Nov 1989 in Queen Victoria Maternity Hospital, Launceston. 6-Melvyn Keith Badcock was born on 22 Feb 1991 in Queen Victoria Maternity Hospital, Launceston. 6-Benjamin James Badcock was born on 12 Mar 1994 in Queen Victoria Maternity Hospital, Launceston. 6-Steven Paul Badcock was born on 26 Jul 1995 in Queen Victoria Maternity Hospital, Launceston. 6-Daniel Thomas Badcock was born on 4 Dec 1996 in Queen Victoria Maternity Hospital, Launceston. 5-David Melvyn Badcock was born on 8 Feb 1948. David married Cloyda Denise Hudson in Newcastle, New South Wales. Cloyda was born on 18 Aug 1948. They had three children: Sonya Ann, Kim Denise and Aaron John. 6-Sonya Ann Badcock was born on 26 Feb 1969. 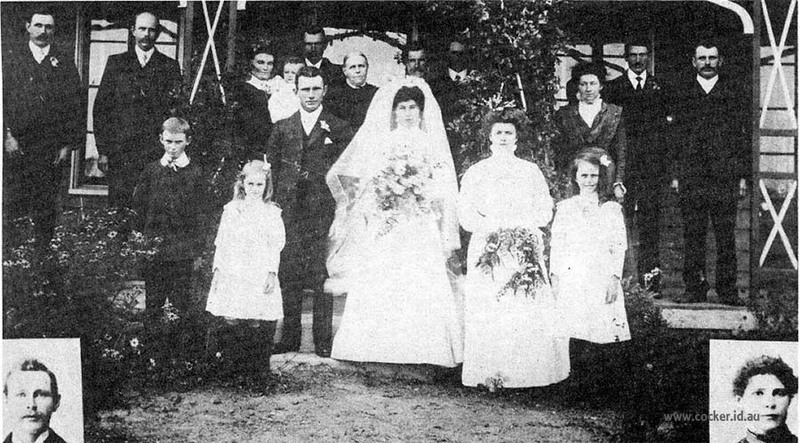 Sonya married Jonathon Richard in Newcastle, New South Wales. Jonathon was born on 10 Aug 1960. 6-Kim Denise Badcock was born on 16 Jan 1971 in Newcastle, New South Wales. Kim married Richard John Burwood in Newcastle, New South Wales. Richard was born on 17 Nov.
6-Aaron John Badcock was born on 21 Jun 1976 in Newcastle, New South Wales. Aaron married Nayerra Said on 14 Jan 2006. 5-Janine Gaye Badcock was born on 21 Aug 1951 in Queen Victoria Maternity Hospital, Launceston. Janine married Robert Alexander Wilson in Newcastle, New South Wales. Robert was born on 2 Feb 1945. They had two children: Karl Adrian Robert and James Bruce Robert. 6-Karl Adrian Robert Wilson was born on 22 Oct 1973 in Newcastle, New South Wales. 6-James Bruce Robert Wilson was born on 22 Nov 1974 in Newcastle, New South Wales. James married Julie Hamwood in London, England. 4-Trevor Melvyn Badcock was born on 11 Aug 1913 in Longford, Tasmania. Trevor married Eileen May Howard, daughter of Ernest Henry Howard and Alice Maud Mary Gee. Eileen was born on 4 Mar 1913 in Melrose, Cressy. They had one daughter: Nancy Eileen. 5-Nancy Eileen Badcock was born on 4 Jul 1950. Nancy married John David Casey. John was born on 28 Sep 1945. They had two children: Andrew John and Manda Maree. 6-Andrew John Casey was born on 4 Oct 1975. 6-Manda Maree Casey was born on 25 Feb 1979. 4-Tasman Badcock was born on 6 Dec 1914 in Green Rises, Cressy, Tasmania and died on 6 Dec 1914. 4-Lillias Joyce Badcock was born on 23 Feb 1916 in Cressy, Tasmania, died on 2 Apr 2007 in the Launceston General Hospital at age 91, and was buried on 26 Apr 2007 in Service at Uniting Church, Longford. Lillias married John Allan Chilcott, son of Joseph Chilcott and Maria Richards. John was born on 22 Jul 1909 in Bracknell, Tasmania, died in 1993 at age 84, and was buried in General Cemetery, Bracknell, Tasmania. 4-Jeffrey Isaac Badcock was born on 22 Aug 1918 in Cressy, Tasmania, died on 19 Jun 2002 in Launceston at age 83, and was buried on 24 Jun 2002 in Longford, Tasmania. Jeffrey married Maisie Edith Prewer, daughter of Atheling George Prewer and Kate Lacey Houghton. Maisie was born on 11 Jan 1920, died on 5 May 2005 in Toosey Memorial Hospital, Longford, Tasmania at age 85, and was buried on 9 May 2005 in Lawn Cemetery, Longford, Tasmania. They had four children: Terrence Jeffrey, Anthony John, Shirley Margaret and Pamela Maisie. 5-Terrence Jeffrey Badcock was born on 24 Feb 1940 and died on 15 Sep 2009 at age 69. Terrence married Dorothy Joan Murfet. Dorothy was born on 20 Sep 1941. They had four children: Lynette Fay, Marie Judith, Helen Dawn and Gayle Terri. 6-Lynette Fay Badcock was born on 30 Sep 1963 and died on 21 Apr 1981 at age 17. 6-Marie Judith Badcock was born on 30 Nov 1964 and died on 21 Apr 1981 at age 16. 6-Helen Dawn Badcock was born on 7 Mar 1968. Helen married Michael Smith. 6-Gayle Terri Badcock was born on 5 Aug 1972. 5-Anthony John Badcock was born on 14 Aug 1942. Anthony married Marilyn Winifred Targett. Marilyn was born on 25 May 1949. They had three children: Julie Marilyn, Teena Margaret and Ross Anthony. 6-Julie Marilyn Badcock was born on 25 Jan 1971. 6-Teena Margaret Badcock was born on 22 Jul 1972. 6-Ross Anthony Badcock was born on 23 Sep 1975. 5-Shirley Margaret Badcock was born on 26 Sep 1947. Shirley married Bernard Leslie Spencer. Bernard was born on 1 Sep 1947. They had three children: Dawn Shirley, Barry Leslie and Belinda Jane. 6-Dawn Shirley Spencer was born on 8 Nov 1968. 6-Barry Leslie Spencer was born on 20 Sep 1971. 6-Belinda Jane Spencer was born on 12 Oct 1973. 5-Pamela Maisie Badcock was born on 28 Jan 1949. Pamela married Graham Dean Fuller. Graham was born on 5 May 1947. They had two children: Annette Pamela and Sharon Barbara. 6-Annette Pamela Fuller was born on 21 Aug 1971. 6-Sharon Barbara Fuller was born on 7 Sep 1973. 4-Raynor Lloyd Badcock was born on 25 Sep 1922. Raynor married Doris Barbara Gilham. Doris was born on 24 Sep 1927. They had six children: Michael Lloyd, Robyn Maree, Karen Gay, Cindy Ann, Kim Alexander and Tanya Jane. 5-Michael Lloyd Badcock was born on 8 Jul 1948. Michael married Carolyn Faye Mercer. Carolyn was born on 15 Jul 1950. They had four children: Rachel Louise, Sharon Maree, Kristian Lloyd and Tina Elizabeth. 6-Rachel Louise Badcock was born on 22 Feb 1971. 6-Sharon Maree Badcock was born on 16 Aug 1972. 6-Kristian Lloyd Badcock was born on 30 Dec 1973. 6-Tina Elizabeth Badcock was born on 23 Jan 1976. 5-Robyn Maree Badcock was born on 16 Dec 1950. Robyn married Lawrence Ronald Green. Lawrence was born on 17 Jul 1950. They had three children: Melinda Jane, Nicole Maree and Leah Briony. 6-Melinda Jane Green was born on 13 Dec 1973. 6-Nicole Maree Green was born on 13 Mar 1976. 6-Leah Briony Green was born on 15 Oct 1978. 5-Karen Gay Badcock was born on 11 Nov 1953. Karen married Richard William Reisz. Richard was born on 25 Apr 1952. They had three children: Casey Erin, Tyler William and Laura Kate. 6-Casey Erin Reisz was born on 12 Jul 1979. 6-Tyler William Reisz was born on 31 Mar 1981. 6-Laura Kate Reisz was born on 11 May 1983. 5-Cindy Ann Badcock was born on 2 Nov 1956. Cindy married Noel Paul Sargent. Noel was born on 18 Jul 1954 and died on 1 Sep 1977 at age 23. Cindy next married Ian Richard Thomas. Ian was born on 5 Aug 1952. They had one daughter: Amy Jane. 6-Amy Jane Thomas was born on 31 Dec 1981. 5-Kim Alexander Badcock was born on 26 Jul 1959. Kim married Sally Anne Medwin. Sally was born on 25 Oct 1964. 5-Tanya Jane Badcock was born on 19 Nov 1961. Tanya married Darron Mark Beston. Darron was born on 21 Jul 1952. They had one daughter: Jane Ella. 6-Jane Ella Beston was born on 29 Mar 1988.